After breakfast, a short trip to a shopping center with later transfer to the airport for the flight to Luang Prabang. After your flight transfer to your hotel. Stroll on foot through the beautiful city of Luang Prabang, a World Heritage Site by UNESCO. Visit some monuments (Vixoun Wat, Wat mai, Xiengthong Wat, Wat Sene). Near a temple, visit a craft factory paper Sa, a specialty of Lang Prabang. Snack near the Mekong to enjoy the sunset then shopping at the night market. Dinner at local restaurant and overnight at your hotel. Rising early to see the offerings to the monks. Breakfast at the hotel then visit the fresh market. Visit of the National Museum (former Royal Palace) built in 1904, a mixture of traditional Lao and French classical style, the discovery of papermaking. Transfer by minibus to the wonderfull waterfalls of Khuang Si, on the way, stop at a Kmu village. Swimming possible in a large blue lagoon at the foot of the falls. Return to Luang Prabang, visit the tomb of Henri Mouhot, and Ban Phanom village. Shopping at the night market for those who wish. Night and dinner at your hotel. Start with a walk towards the banks of the Nam Khan river with a climb up to Mount Phousi (best view in town). Visit Ban Sang Hai village specialized in distilling Lao whiskey (manufacture of spirits). Departure from the hotel towards the Elephant Village. Welcome by the Head of the camp. 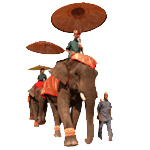 Basic instruction and then ride on elephant back (about 1 hour) in an impressive environment. After breakfast, excursion by motor boat on the Nam Khan, swimming possible in the falls of Tad Sae then return to Luang Prabang by late afternoon. Dinner show at a local restaurant and overnight at the hotel. Transfer to the boat "Wat Phou" and down the Mekong to the site pre-Angkorian Wat Phou. During the cruise, the boat will stop for the visits of various typican Laotian villages: Huei Thamo, Oum Moung Temple (hidden in the forest), Khong Island. Walk on the widest part of the Mekong, in the middle of the islands Si Phan Don (4000 islands) where you can admire the livelihoods of fishermen and peasants. Today we will explore Ban Veuthong, the "Nigara of the East", Pakse and Xieng Di. Loitering on Khong Island, get a glimpse of life in the villages and temples. See the remains of the colonial French presence. Walk to the falls of Khone Pha Pheng. Breakfasts and meals during the cruise are included in the delivery. As a guidance, the tour price for this Laos tour is $1339, based on 4 people in standard accommodations.